Dasara is a major festival celebrated across the country by one and all irrespective of the caste and creed. It generally occurs during the months of September – October that coincides with Aaswayuja masam of Hindu lunar calendar. 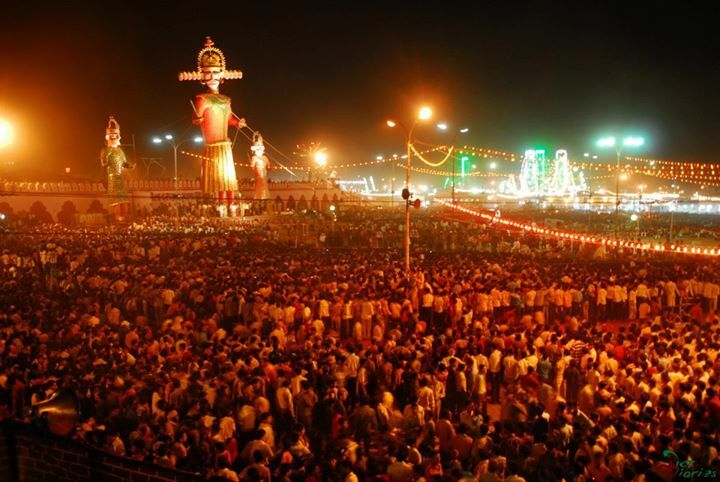 Nine day festival is known as Devi Navarathri or SharanNavarathri or Durga Navarathri or Dasara. The festival gets concluded on the 10th day known as Vijaya Dasami. Though it is celebrated across the country, different customs and traditions are followed in different regions. Some of the major customs and traditions are as follows. While it is generally celebrated for nine days, some people celebrate the festival for seven days, or five days or three days. The festival of Devi Navarathri also coincides with Navarathri Brahmotsavam of Lord Sri Venkateshwara at Tirumala temple. During the nine day festival the Divine Energies, the Trinal Goddesses Lakshmi, Saraswathi and Parvathi are worshipped in a combined Divine energy form known as Shakthi. All the Durga/Shakthi related temples especially in South India make out a grand celebration of Devi Navarathri festival and worship the Goddess decorating Her in different forms. While there is no standardization of these forms, mostly the Goddess is decorated as Kanaka Durga, Bala Tripurasundari, Annapurna, Gayathri, Lalitha Tripurasundari, Lakshmi, Saraswathi, Durga, Mahishaasuramardhini and Sri Raja Rajeswari during these nine days. On the 10th day known as Vijaya Dasami the Goddess is taken out in a grand procession across the streets of the town or village up to Shami Tree where the Goddess is worshipped as Aparajitha Devi. At the home front, people keep Kalasha during Navarathri and worship the Goddess Shakthi according to their sampradaya. In some families there is also a tradition of lighting a lamp in Pooja room that glows as Akhanda (continuously) throughout the nine day period. Ghee or Thil oil is used for this purpose. There is also a sampradaya to worship Lord Sri Venkateshwara during Navarathri festival. There is also a custom of observing fast during the days of Navarathri. During Navarathri period, Parayana (Pravachana) or Sravana(listening) of sacred scripts like Sri Devi Bhagavatham or Sri Venkatesa Mahatyam or Sri Mad Bhagavatha Purana or Bhagawadgeeta etc. is considered meritorious. This is generally organized either at home or at temples. In Durga temples special Homas are performed like Chandi Homa etc during Navarathri. Parayana or Sravana of Sri Venkatesa Mahatyam during Navarathri days is considered highly meritorious as this period also coincides with Navarathri Brahmotsavam of Lord Sri Venkateshwara at Tirumala temple. On the day of Moola Nakshatra, Goddess Saraswathi Devi is worshipped in the form of books. There is also a tradition of performing Aksharabhyasam, formal induction of a child into learning on this day. It is believed to be an auspicious day to begin learning any form of education. Basara the temple town of Goddess Saraswathi in Andhra Pradesh will be full of activity on this day with thousands of people from various states participating in the celebrations. On the ninth day viz. Maha Navami, a ritual known as Aayudha Pooja is performed, where we find people performing Pooja to their vehicles, instruments, machinery, tools and implements, weapons, even household tools, computers etc. Factories also perform Aayudha Pooja to their machines on this day. This pooja is performed by all those who use the instruments in one way or the other like hospitals, police stations, shops and establishments etc. Transport operators perform pooja to their vehicles on this day and take their vehicles for circumambulation around the Shami tree. People break Pumpkins in front of their establishments as a mark of getting rid of the evil. In some regions this ritual is performed on the Dasara day. In South India especially in the states of Andhra Pradesh, Karnataka and Tamil Nadu, Dasara is a grand festival that is celebrated with lot of fanfare and religious gaiety. At the home front we find people exhibiting colorful toys during Navarathri day and invite their friends and relatives to their houses in the evenings. This custom of arranging toys during Navarathri days is known as Bommala Koluvu in Telugu, Bombe Habba in Kannada and Bommai Kolu in Tamil. On the day of Vijaya Dasami, in the evening, people visit Shami tree in their vicinity along with their family and friends and exchange its leaves as a goodwill gesture. This ritual is known asSeemollanghana or crossing the territory where they live. This ritual of Seemollanghana we find in the states of Andhra Pradesh, Karnataka and Maharastra. In Mysore the historical and temple city of Goddess Chamundeshwari, the seat of one of the Ashtadasa Shakthi Peetas, Dasara is a colorful and grand festival. Mysore is said to have derived its name from the demon king Mahishaasura who has been vanquished by the Goddess Chamundeshwari. A special mention need to be made about the world famous Mysore Dasara festival. It attracts thousands of audience from India as well as from abroad. Mysore the seat of erstwhile Wadiyar dynasty, the descendants of Royal family are still continuing the tradition of Dasara festival. During these Navarathri days current incumbent of Royal family worship the Goddess Chamundeshwari on the top of the hills and conduct special Royal Durbar. Mysore Dasara festival known as Naada Habba is a State festival where Govt. of Karnataka takes an active part. During these nine days various cultural programs are arranged including music and dance concerts. Number of artists from across the country participates in the event. Mysore Dasara Kusti Spardhe (wrestling bout) is an attraction during Dasara festival which attracts wrestlers from across the country. A special commercial exhibition is also held in Mysore city on the occasion of Dasara. The nine day festival is concluded on the Vijaya Dasami day by holding a traditional and grand Dasara procession known asJambu Savaari. During this event the idol of Goddess Chamundeshwari Devi is taken out in procession seated in a Golden Mantapa (pavilion) mounted on a decorated elephant. The procession is held in a grand manner like a parade participated by colorful tableaux, music band, decorated horses, camels and elephants along with the local citizens and the tourists. It finally culminates at a place known as Bannimantapa where Shami tree is worshiped. Banni is a Kannada word for the Sanskrit word Shami. In Telangana region of Andhra Pradesh a unique custom of worshipping the Goddess known as Bathukamma is observed. This is a seasonal festival that is held during Navarathri days participated by Hindu women. During the festival, women arrange in a plate various seasonal flowers in the form of a basket and on the top of it keep a Gouri idol made with turmeric powder. After worshipping the Goddess, women join together and perform dance around the flower baskets singing local folk songs. Finally they immerse this flower arrangement in rivers or lakes. Bathuku is a Telugu word meaning life and Bathukamma means the Mother Goddess, the one who protects the life of the people. It is a thanks giving festival in honour of the Goddess for having protected their lives from all evils. This festival gets concluded two days before Vijaya Dasami festival. While in South India it is mostly a Durga related festival, in North India and parts of Maharastra, Vijaya Dasami (Dasara) is considered mainly as a mark of Lord Sri Rama’s victory over Ravanaasura. It is celebrated by a custom known as Ramleela. During this ritual large effigies of Ravana, Kumbhakarna, and Meghanath, are taken out in a grand procession to a large open ground. After reaching there a skit of Ramleela is enacted by the artists. At the end of the ritual the people shoot the effigies with arrows and set them on fire at the time of sunset. The effigies fully covered with fire crackers catches fire and then bursts. Hundreds of people participate in this ritual which is also celebrated nowadays even in other parts of the country. During these nine days many plays and dramas based on the stories of Ramayana are performed. The place where these effigies are burnt is known as Ramleela Maidaan. In West Bengal and Calcutta the seat of Maha Kali temple the festival known as Durga Pooja is celebrated for four days starting from seventh day. We find large sized clay idols of Goddess Durga are installed and worshipped during Durga Pooja. On the 10th day, the day of Vijaya Dasami these idols are taken out in a grand procession and immersed in holy waters of river Ganges. Nowadays we find Durga idols being installed even in other parts of the country also. In Maharastra on the day of Vijaya Dasami people worship Aapta tree and exchange its leaves as a goodwill gesture and as a symbol of Gold. Aapta is Kannada word, commonly known as Sona tree it is called as Katmauli in Hindi and as Yaamalapatra in Sanskrit. 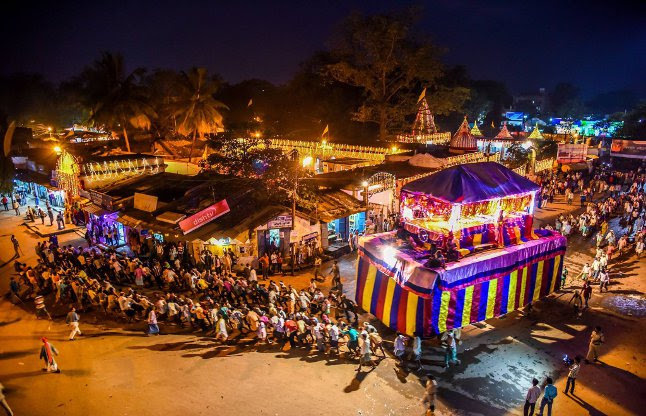 In Gujarat it is a community event, where people from all walks of life participate in a special celebration known as Dhaandiya Raas singing songs and performing dance in groups during Navarathri. Vijayadasami is also celebrated outside India in Nepal and Mauritius as a major festival. With its multifarious customs and traditions, the festival of Dasara-Vijaya Dasami is conveying a message of ultimate victory of Good over the Evil, unity in integrity, happy and harmonious living of people across the country.